I've mentioned in a previous entry how much I enjoy those rare lunch out moments with colleagues. Since my current work location is situated beside a not-so-complete mall and to get to one would require hailing a cab or driving a car, this somehow limits us to choose from whatever is available in the building or somewhere within walking distance. Thus, upon the invitation of a colleague who is planning to fill up her beauty loot in Bonifacio Highstreet, I immediately accepted her offer to join her for lunch at The Stock Market. I've been hearing a lot of mixed feedbacks about Del Monte's newest restaurant. Good and bad this made me even more excited to try it out myself. Browsing the menu, we first noted that it was a bit pricey (Price ranges from Php. 200++ to Php. 500++). I also wanted to play safe so we asked the server for his recommendations. 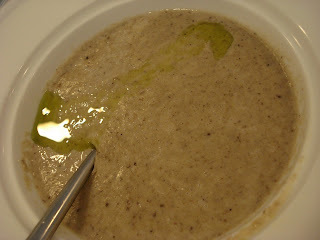 Since I wanted to just have a light lunch, I chose the Cream of Porcini Mushroom soup with Truffle Oil (Php. 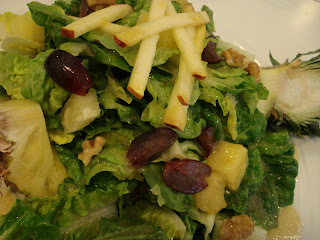 260) and the Stock Market Fresh Harvest Salad with Pineapple Vinaigrette (Php. 240). Over chitchats and laughters, our orders arrived shortly. I was so excited to try the soup because I love truffle oil and seeing the oil splashed on top of my creamy soup made it even more inviting for me to scoop in. I love chewing the tiny bits of mushroom however I find the soup a tad too salty for my taste. In fact, I had to ask my colleague for a couple of crostinis which I added into my soup to somehow lessen the saltiness of it. Looks like the chef was having a grand time with the salt shaker. Eventually, I was able to finished my soup together with a full glass of water. Thankfully, my salad was served right after. From the salty soup, I moved on to my tangy Pineapple salad which got a perfect score for presentation. Even my colleagues were impressed! Imagine, crispy lettuce served on a pineapple bowl topped with seedless red grapes, pineapple chunks, apple strips, nuts and generously drizzled with pineapple vinaigrette. I'd say, this salad is best enjoyed at the farm with the cool wind blowing and the feel of soft grass beneath your feet. I got my wish for wanting a light lunch but for the price, I felt like I should have just settled for a piece of roast chicken, bread and steamed veggies elsewhere. My total bill was exactly Php. 500 + tax, which I find a bit too much considering that all I got was a bowl of soup and a plate of salad. Hmm..
After sharing my insights with my boss, he told me to give it another try and perhaps to just skip the soup and salad and to just get one of their meaty best-sellers. I guess he's right... with that, I'd say, "I Shall Return." 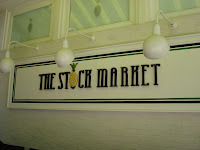 The Stock Market is located at the Bonifacio Highstreet, Taguig. Soup kind of reminded me of Campbells, hehe.